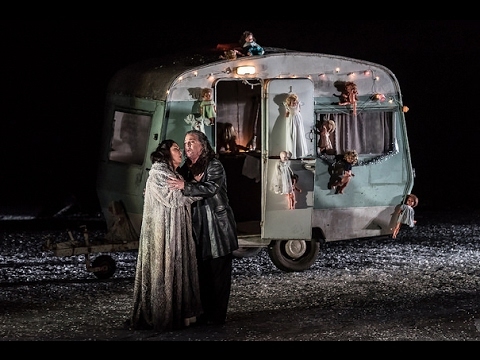 Swiss designer Patrick Bannwart made his Royal Opera debut in 2016 on Il trovatore, directed by David Bösch. Bannwart grew up in Birmenstorf and began his career as a painter in the production department of Zürich Opera. He went on to study set design with Erich Wonder at the Academy of Fine Arts, Vienna (1997–2000) and has gone on to work as a designer in Austria, Germany and Switzerland. He first collaborated with Bösch in 2004 on Wedekind’s Spring Awakening and has since worked regularly with the director on theatre productions including Much Ado About Nothing and Port (Salzburg Festival), Woyzeck and Liliom (Schauspiel Essen), Mother Courage, Das Käthchen von Heilbronn and Tankred Dorst’s Parzival (Burgtheater Vienna) and A Clockwork Orange (Schauspielhaus Zürich). Bannwart’s opera designs for Bösch include L’elisir d’amore, Mitridate, re di Ponto and L’Orfeo (Bavarian State Opera), Der fliegende Holländer and Königskinder (Frankfurt Opera), Simon Boccanegra (Opéra de Lyon) and Elektra (Opera Vlaanderen).